After being competitive with Football Bowl Subdivision opponents in recent seasons, Stony Brook failed to seriously challenge Temple on Saturday afternoon, falling 38-0 at Lincoln Financial Field in Philadelphia, Pennsylvania. The Owls, who were runners-up in the American Athletic Conference in 2015, found the end zone early and often against the Seawolves. The two teams traded punts to open the game, then Temple redshirt freshman wide receiver Cortrelle Simpson took the ball on a reverse play and ran 36 yards along the left sideline. Two plays later, sophomore running back Ryquell Armstead punched in a 3-yard carry to give the Owls a 7-0 lead. Stony Brook failed to record a first down on the following drive — the first of six consecutive possessions without moving the chains — and Temple responded by marching down the field, where senior quarterback Phillip Walker found redshirt junior Keith Kirkwood on a 5-yard pass into the endzone. The touchdown, the first of Walker’s three and the first of Kirkwood’s two, put Temple in the lead, 14-0. By the end of the first half, the lead had grown to 28-0, while the announced crowd of 22,296 had diminished substantially. The 93-degree heat was one factor, but the game’s lopsidedness seemed to be the main deterrent. Stony Brook’s offense ended the day with seven first downs, nine punts and no points. Its 133 yards is the fewest for the program in recent memory. “Their defense played a great game. We didn’t. That’s what happened,” redshirt sophomore quarterback Joe Carbone said. Carbone threw a pair of interceptions in the game, gaining just 29 yards through the first three quarters of the game, before Temple inserted its backup players into the game. While the vaunted Stony Brook defense — the Football Championship Subdivision’s best last season — allowed 38 points, much of the damage was facilitated by the short fields it was forced to protect. Stony Brook redshirt sophomore punter Marc Nolan was erratic at times, with kicks of 26 and 19 yards in the first half. Temple had long returns on other punts and also capitalized on turnovers to gain optimal field position. Through the first three quarters, the Owls did not start any of their 12 drives inside their own 30-yard line. FBS schools are allowed to issue 85 scholarships to football players, while FCS schools are only permitted 63. The Seawolves defense limited the Owls to 301 yards overall, an average of 4.7 per play. 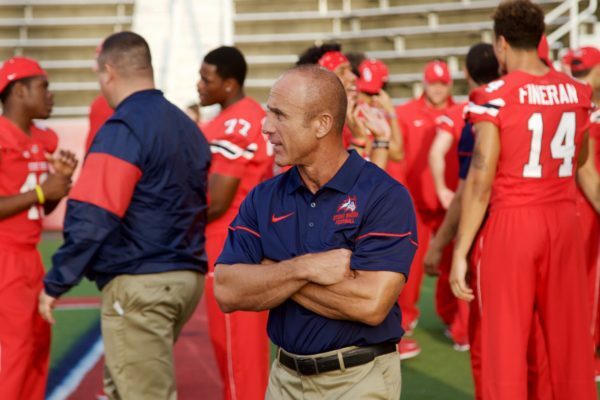 On an ordinary day, such numbers would put the team in a position to win, but in Saturday’s game, it could not make up for Stony Brook’s ineptitude. The game, which was held at the home stadium of the Philadelphia Eagles, was the second game in Stony Brook Football history to take place in an NFL stadium. Six seasons ago, the Seawolves lost to the South Florida Bulls, 59-14, in Raymond James Stadium, home of the Tampa Bay Buccaneers. The road will not get any easier for the Seawolves. On Saturday, Stony Brook hosts No. 2 Richmond, one of the best FCS teams in the nation. While the Seawolves were outclassed in their FBS matchup this season, the Spiders defeated the Virginia Cavaliers of the Atlantic Coast Conference, 37-20, in Week 1. The game will kick off at Kenneth P. LaValle Stadium at 12 p.m.